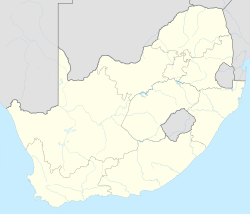 Phuthaditjhaba (formerly Witsieshoek or Qwaqwa) is a town in the Free State province of South Africa. Phuthaditjhaba is a seSotho name that means meeting place of the tribes. It is located on the banks of the Elands River. It also located in a section of Drakensberg mountains (Maloti in the Sesotho language). it is bordered by the province of KwaZulu-Natal to the southeast and the independent country of Lesotho to the southwest. The frequent snow on the Drakensberg mountain peaks surrounding the town led the San to call the region Qwa-Qwa (whiter than white). It was known as Witsieshoek to the European settlers, after Oetse, also Witsie and Wetsi, a Makholokoe chief who lived there from 1839 to 1856. The area was inhabited by two clans of the Basotho, the Bakoena and the Batlokoa. The Orange Free State government settled these people there in the 1870s after concluding a peace settlement with their leaders. 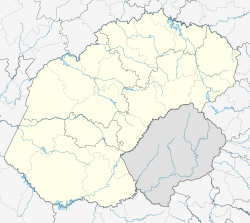 In 1926 the Orange Free State government placed the Batlokoa under the authority of the Bakoena but gave each group its own regional authority in 1930. In 1969 they were combined into a single territorial authority, which was replaced two years later by a legislative assembly. Qwaqwa was granted self-government in 1974. In 1974 Phuthaditjhaba became capital of the bantustan or homeland of QwaQwa. When the apartheid system was abolished in South Africa in 1994, Phuthaditjhaba became part of the Free State province. Phuthaditjhaba is the formal gateway to rural Qwa-Qwa. Service provision in the area is difficult - the land is mountainous and homes in remote areas lack access to basic services. Qwa-Qwa is the poorest area in the Free State Province. It is home to the Mofumahadi Manapo Mopeli Regional Hospital. Phuthaditjhaba is the birthplace of the Premier Soccer League side club Free State Stars. Although the club has since relocated to Bethlehem, it still plays its important games at the much larger Charles Mopeli Stadium. The town has two other professional soccer teams, namely Maluti FET College FC and African Warriors FC who both use the Charles Mopeli Stadium as their homeground. The teams both participate in the National First Division, with Maluti FET College FC making their debut in the division. ^ a b c d "Main Place Phuthaditjhaba". Census 2011. ^ "Dictionary of Southern African Place Names (Public Domain)". Human Science Research Council. p. 478. Retrieved 2014-01-09.